The Bureau of Justice Statistics released a report exploring the fastest growing portion of the prison population, those 55 or older. The prison population is getting older. A Bureau of Justice Statistics (BJS) report released this morning, Aging of the State Prison Population, 1993-2013, explores the changing age dynamics in state prisons over a 20-year period. While we have previously explored the prison boom among the elderly in New York state prisons, this report offers a national perspective on what is driving prison growth among older adults. Trends in imprisonment for those over 45 are the exact opposite of what is happening in the national prison population, which has been slightly decreasing in recent years. According to the Bureau of Justice Statistics, people 55+ are now the fastest growing age group in the U.S. prison population. While the total rate of imprisonment has been going down since 2003, the rate for those 45 or older has been increasing steadily. Changes in prison population can come from changes in admission rates and changes in sentence lengths. The Bureau of Justice Statistics attributes the massive growth in the aging prison population to both. Also notable is the rate of new court commitments per 1,000 arrests increasing for violent and property offenses for all age groups from 1993 to 2013. The rate for property offenses nearly quadrupled for those 55 or older (see page 19 of the report). The Bureau of Justice Statistics reports that those over 55 are also given longer sentences and are expected to serve more of their sentence compared to their younger counterparts. In 2013, adults over 55 were expected to serve almost 50 more months in prison compared to those 18–39. The report does not delve into the causes for this change beyond a reminder that state policy controls sentencing decisions. Some of this isn’t new, but what is new and useful is the report’s effort to disaggregate national prison population data by age (although it is not available at the state level), despite some Bureau of Justice Statistics data series collections not requiring facilities to report the ages of those they have in prison. While the portion of the prison population over 55 years old was only 10% in 2013 (up from 3% in 1993), this number is likely to continue to grow, requiring states to reevaluate how they manage the graying prison population. Some states are beginning to recognize the differing needs of an aging prison population by providing special programming, housing, and medical care to those considered “elderly” by the facility. Other options are compassionate or early release programs, and utilizing common sense when making parole decisions. 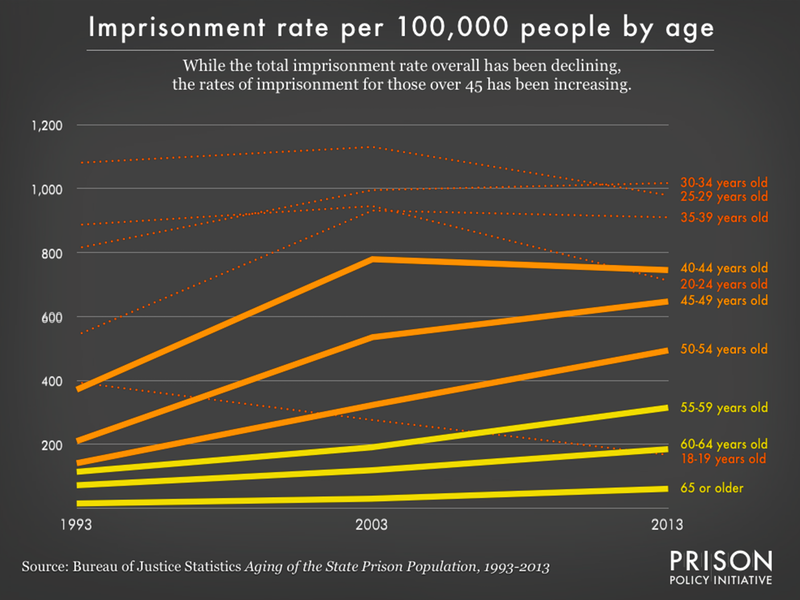 The growth of the graying prison population shows no signs of slowing down. 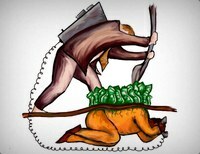 The Council of State Governments warns, “as America’s prisoners continue to grow older and sicker, the costs to states will continue to rise.” States are going to have to take action now to make sure those aging are properly cared for or better yet, released back into the community.